The quiet company of your true love can be the perfect complement to a savory culinary delight, or step away from the ordinary and into a themed wonderland of the most extravagantly cultural fare. One moment you can be clutching that special someone while falling 13 stories in a runaway elevator, the next moment you can sip an aromatic Merlot during a romantic, candlelit dinner for two. Here are my suggestions for the most romantic restaurants that Walt Disney World has to offer: 10. Flying Fish Cafe, Disney's Boardwalk 9. Le Cellier, Epcot 8. Restaurant Marrakesh, Epcot 7. The Hollywood Brown Derby, Disney's Hollywood Studios 6. Artist Point, Disney's Wilderness Lodge 5. Bistro de Paris, Epcot 4. Jiko-The Cooking Place, Disney's Animal Kingdom Lodge 3. California Grill, Disney's Contemporary Resort 2. Narcoossee's, Disney's Grand Floridian Resort & Spa 1. Victoria & Albert's, Disney's Grand Floridian Resort & Spa There are over 100 restaurants from which to choose at Walt Disney World. Reservations for most restaurants can be made in advance, so be sure to call 407-WDW-DINE to discuss different options and to make reservations. 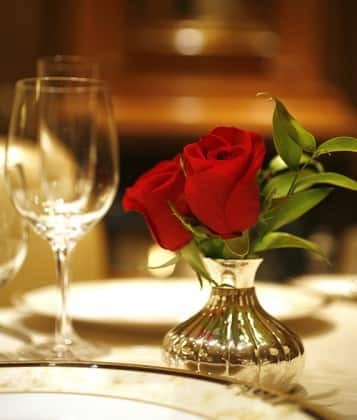 Book now to look forward to the romantic atmosphere and delectable delights that are waiting for you!